A cash machine has reopened at a former Speyside bank – more than a year after Clydesdale moved out of its last base in the area. The firm’s branch in Aberlour shut in May last year despite officials being presented with a petition of more than 500 signatures protesting at the move. The removal of the village’s last hole in the wall provoked anger from locals and tourists alike. But now, a cash point has been brought back to the former High Street bank, which has since been revitalised as a wool and coffee shop. 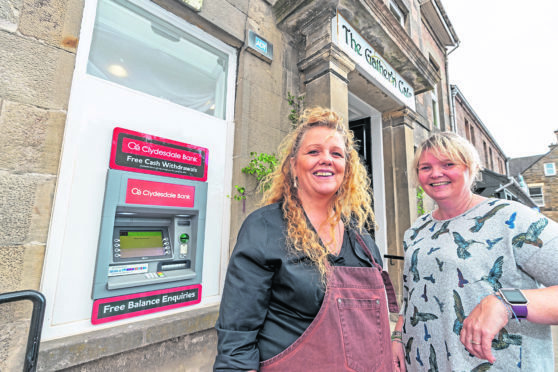 Businesswoman Sarah Nairn-Anderson, owner of The Gather’n , which now trades from the building, revealed she had to make the return of the ATM a condition of taking over the site. She said: “At one stage, they weren’t going to put it in. I really had to be quite tough with the bank to tell them how badly it was needed. “It came to the point where I had to tell them I wasn’t going to go through with the deal unless they put it back. “The machine does make it more affordable for me to have the building, but having no bank machine has been a real struggle. Everybody has suffered because of it. Mrs Nairn-Anderson’s firm, which was previously known as Three Bags Wool, moved into the Clydesdale building last month – where the businesswoman runs the shop from the former vault. Yesterday, engineers from the bank made final checks on the machine to ensure customers will be able to access their cash. Speyside Glenlivet councillor Louise Laing, who led the petition opposing the bank’s closure, is among those delighted at the development. Clydesdale had always insisted it was willing to return a bank machine to Aberlour, but was unable to do so while the building was empty for “security reasons”. Speyside Glenlivet councillor Louise Laing revealed queues of customers attempted to use the new ATM before cash was even put in it. She said: “Just standing next to it you could see the amount of people wanting to use it. It shows how badly it was needed. Brian Doran, chairman of business association About Aberlour, added: “It’s great news. It’s certainly something that has been visiting for our visitors.